Ever since the discovery of fossils of Australopithecus in South and East Africa during the middle years of the 20th century, the origin of the human lineage has been thought to lie in Africa. More recent fossil discoveries in the same region, including the iconic 3.7 million year old Laetoli footprints from Tanzania which show human-like feet and upright locomotion, have cemented the idea that hominins (early members of the human lineage) not only originated in Africa but remained isolated there for several million years before dispersing to Europe and Asia. 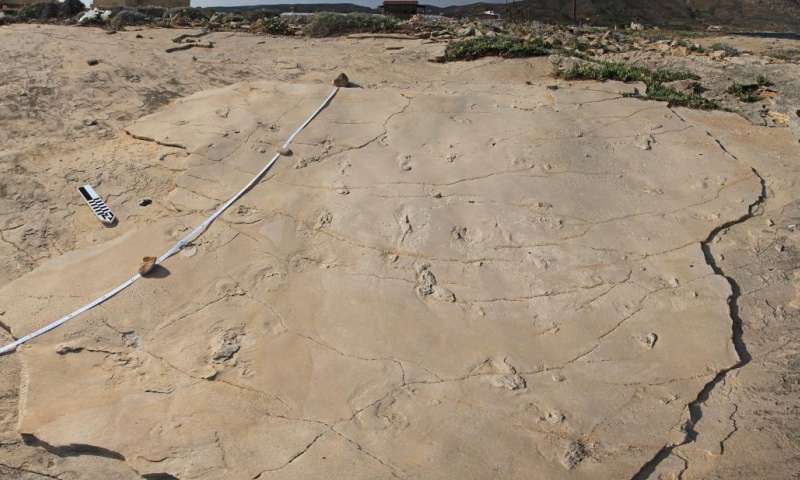 The discovery of approximately 5.7 million year old human-like footprints from Crete, published online this week by an international team of researchers, overthrows this simple picture and suggests a more complex reality. Human feet have a very distinctive shape, different from all other land animals. The combination of a long sole, five short forward-pointing toes without claws, and a hallux ("big toe") that is larger than the other toes, is unique. The feet of our closest relatives, the great apes, look more like a human hand with a thumb-like hallux that sticks out to the side. The Laetoli footprints, thought to have been made by Australopithecus, are quite similar to those of modern humans except that the heel is narrower and the sole lacks a proper arch. By contrast, the 4.4 million year old Ardipithecus ramidus from Ethiopia, the oldest hominin known from reasonably complete fossils, has an ape-like foot. The researchers who described Ardipithecus argued that it is a direct ancestor of later hominins, implying that a human-like foot had not yet evolved at that time. The new footprints, from Trachilos in western Crete, have an unmistakably human-like form. This is especially true of the toes. The big toe is similar to our own in shape, size and position; it is also associated with a distinct 'ball' on the sole, which is never present in apes. The sole of the foot is proportionately shorter than in the Laetoli prints, but it has the same general form. In short, the shape of the Trachilos prints indicates unambiguously that they belong to an early hominin, somewhat more primitive than the Laetoli trackmaker. They were made on a sandy seashore, possibly a small river delta, whereas the Laetoli tracks were made in volcanic ash. "What makes this controversial is the age and location of the prints," says Professor Per Ahlberg at Uppsala University, last author of the study. At approximately 5.7 million years, they are younger than the oldest known fossil hominin, Sahelanthropus from Chad, and contemporary with Orrorin from Kenya, but more than a million years older than Ardipithecus ramidus with its ape-like feet. This conflicts with the hypothesis that Ardipithecus is a direct ancestor of later hominins. Furthermore, until this year, all fossil hominins older than 1.8 million years (the age of early Homo fossils from Georgia) came from Africa, leading most researchers to conclude that this was where the group evolved. 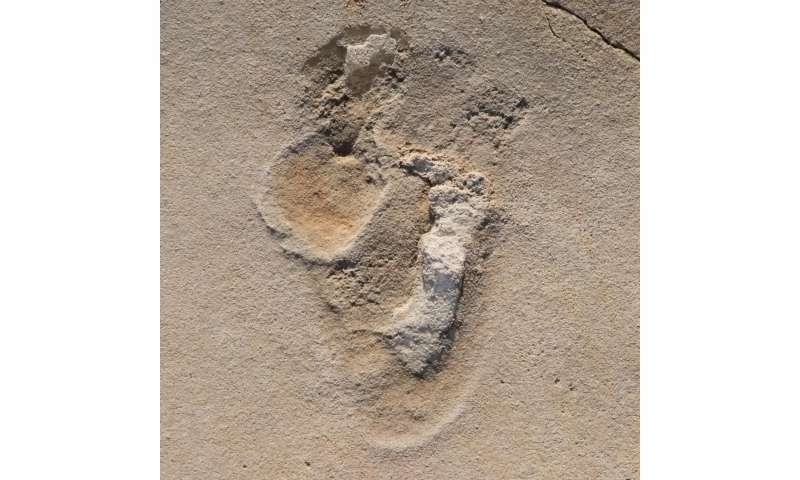 However, the Trachilos footprints are securely dated using a combination of foraminifera (marine microfossils) from over- and underlying beds, plus the fact that they lie just below a very distinctive sedimentary rock formed when the Mediterranean sea briefly dried out, 5.6 millon years ago. By curious coincidence, earlier this year, another group of researchers reinterpreted the fragmentary 7.2 million year old primate Graecopithecus from Greece and Bulgaria as a hominin. Graecopithecus is only known from teeth and jaws. So it's just an enigma for the moment. 1.8 million years after the earliest hominins, some footsteps which are not clear enough to define for sure, only to say that they are probably some kind of ewok with 5 toes from that time. Crete seems like an unlikely place to find hominins, but 1.8 million years is enough time for an ewok to walk around the world thousands of times. Greek islands must have been a strange mountain land, with weird animals. Ooooh. It's always entertaining to see which paleontologist can conjure the most captivating story from the slimmest evidence. One understands why. Creativity garners attention and helps rake in funding. Paleontologists gotta eat. -Make it older than anyone else's story. Competition to push back the timeline is fierce. If you can move it a hundred thousand years you'll get more attention. A million or more is guaranteed to get tongues wagging. -Conviction scores points. Using words like "maybe", "suggests" and "uncertain" is the hallmark of a true scientist but it's boring. It's got to be a hominin, even if it has a tiny skull, climbs trees, eats grass and leaves, and walks on all fours most of the time. Stick to your story. -A master of the craft will flesh out the fossil with a personality and even a gripping and familiar human-interest story that modern humans can relate to. And never forget that Crete is a great place to vacation, I mean, study fossils. aksdad, have you read the paper? Evaluted their findings? I would guess not. All you're doing is questioning the motivations of the authors in reporting that they found. You're not-so-subtly accusing the authors of making up their findings, such as the age and characteristics of the footprints. Slowly the misguided theory of "all life" originating solely in Africa is being hacked to bits. I like when none scientists try to discredit an article solely because it challenges there view of the world. My concern is with the last phrase. "Weather the human origin research community will accept fossile foot prints as coclusive evidence?" If the evidence is solid how could they refuse? Based on faith? Is that where the human origins group is at now? Deny unless it fits with what we believe we know. Well PJ, how do you absolutely confirm that these impressions in ancient sands are definitely, without any possible doubt, the remains of Human footprints? If you have ever walked on the wet sands along a shore? How long did your footprint left behind you remain recognizable? Cause now you have to explain what event safely protected these footprints for over five million years. And how such an event removed all other evidence such as skeletons and tools. Where is the midden of shellfish left by shore dwellers? Anything else that could be positively dated to that period? "Fantastic claims require fantastic proof." Well, there was a discussion of multi cellular life being created more than once. I don't see why the human story can have the same: humans developed more than once. Walking upright may have developed more than once. They're only footprints. We don't know what the creature on top of them was like. May be the exact ancestors we expected, except they're walking upright. OK; that wouldn't be *exact*, but, you get the point. Those transitional fossils from Africa are very scarce, and I don't see this is really much of an odd data point given how much leeway there is there. @rrwillsj, human footprints are pretty distinctive. As Ahlberg says, what makes this controversial is not the character of the prints but their position in Europe, and the timing of the layers above and below them. Dating via foraminifera is distinctly non-controversial. This is going to be a pretty interesting controversy to watch. DS, it will be difficult to corroborate this claim. It is important to remain skeptical of reckless assumption. Cause it is truly embarrassing when new evidence is produced that nullifies a hypothesis based on preliminary, unverified conclusions. Wild speculations are the liquidity of the marketplace of ideas. @rrwillsj, the corroboration is in the footprints. I invite you to show non-hominin footprints with these characteristics. Surely you can find something to substantiate these doubts if they are anything but formless speculation. DS proof is it you want of my disagreement with the conclusions of this report? Go walk on a beach, I don't care which one. Come back an hour later. Are your footprints still visible. Did those footprints retain a recognizable shape? Now come up with a naturally occurring means to protect those footprints for the next few million years. The footprints found in Africa were protected by the products of volcanic activities. And that protective covering slowly eroded away. Corroboration has been found in human remains, tools, midden piles from the same time span. What, on a beach, would have a comparable protection for such an ephemeral event? And where is all the rest of it? Just wanting it to be true, just ain't enough. Who said "all life" originated in Africa? And what's the point of labeling such a theory "misguided"? All I've ever heard along those lines is the single-region theory of human origins. Sounds like you're jonesing a little too hard for a pro-white supremacist narrative. Ummmm, yet there they are. Hard to argue against if it's there in solid rock. Solid rock doesn't sound like "wanting it to be true." It sounds like solid evidence. Questioning how it got there is beside the point, because there it is. @rwillsj, this is brute reality. It doesn't require justification or explanation. What is, is. How it got there is not the point. That it got there is manifest reality. This isn't theory, it's evidence. The same sort of reasoning you're using might lead one to claim there are no stars in the sky. S, have you've heard the joke "An astrologer hasn't been outside to look up in the night sky in the last four thousand years." Okay, in solid stone what appear to be humanoid footprints. Miraculously preserved for five million years. Created by some unknown process. With no other possible explanation or skepticism about these assumptions. Myself? I always begin with questioning the methodology used to collect evidence. Especially when you discover exactly what you set out to find/prove/claim. Extra-especially when there has not yet been a follow-up for supporting evidence. Perhaps my assumption of disbelief is wrong? What's the word for anti-miracle? Similarity to humanoid footprints is not the same thing as an actual humanoid footprint. Accepting that these are possibly real humanoid footprints. Now the researchers have to discover how that was accomplished. Confirm the age of the imprints and seek more data. I just remembered Voltaire quoting a young woman he overheard at a dinner party. Who expressed skepticism of Holy Miracles being expounded by a priest seated next to her. In a sad tone the priest asked. "My daughter, can you deny the miracle of the saint whose head was cut off. Then he picked up his head and wandered across France performing miracles?" (Paraphrasing her reply) "Oh Father, you misunderstand me. I do not deny the miracles performed by the beheaded saint. However, I do deny his first step!"